[miau] If you are looking for a perfectly designed Egyptian themed game, Cleopatra is the perfect choice. It offers bold hieroglyphics and ancient Egyptian symbols. While it may be difficult for some Egyptian themed games to stand out because of the amount of them on any gaming site, Cleopatra has been able to do so since its release. This amazingly popular slot game is found in casinos all over the world, but it is its ease of gameplay and exciting bonuses that are responsible for its popularity. This game is available online as well and in the last few years since it was introduced it has earned as many fans as the casino game it is based on. In fact, it has so many fans it has even spawned a sequel game of the same name. Sequels aside, the original Cleopatra is the perfect way to keep your skills sharp while you wait for your next casino visit or just to enjoy game play in the comfort of your own home or office. The symbols in the game include Cleopatra as the wild symbol and the Sphinx as the scatter symbol. It offers twenty pay lines and five reels with a bonus round that provides an amazing 15 spins. Players can play as many of the playlines as they prefer. The bonus round starts when players are able to hit at least three scatters across their reels. The wild symbol can replace any other symbol on the paylines except the scatter symbol. The jackpots for Cleopatra are some of the highest available from any online casino game. Despite the fact that the jackpots are non-progressive, it is still possible to win with the Cleopatra bonus an astounding amount of money. This is part of the reason for its enormous popularity, but it is also well-loved because it is known also for being simple and straightforward to operate. This makes it the perfect option for beginners who need a game they can learn from. Cleopatra has been highly praised by longtime fans for remaining true to its casino version. It is not uncommon for some online game versions to lose their appeal or excitement when making the transition to online play. This has not been the case here as the graphics, style and sound are identical to what anyone would see inside a casino. Cleopatra is known throughout casinos around the world for its easy playability and excellent winning potential. It is these features which help it to remain popular, despite its release years ago. Fans of the game will be happy to know, these features are not lost as the online version even offers all of these benefits and even includes a slightly higher payback rate than the casino version. Newbies are able to play Cleopatra online to become familiar with it before they move on to placing genuine bets. 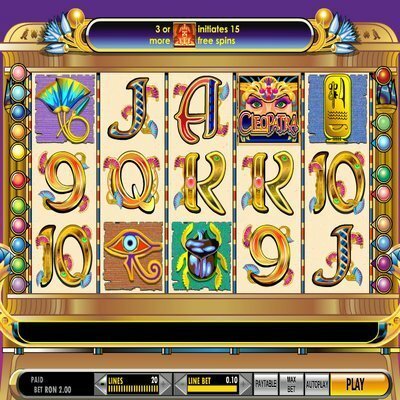 It is available from a variety of online casinos sites and free play is often possible without even needing to register or perform any downloads. While it is not uncommon for new players to be directed to Cleopatra, this game is still interesting and exciting enough, with large enough jackpots to continue to appeal to even the most experienced slots player.